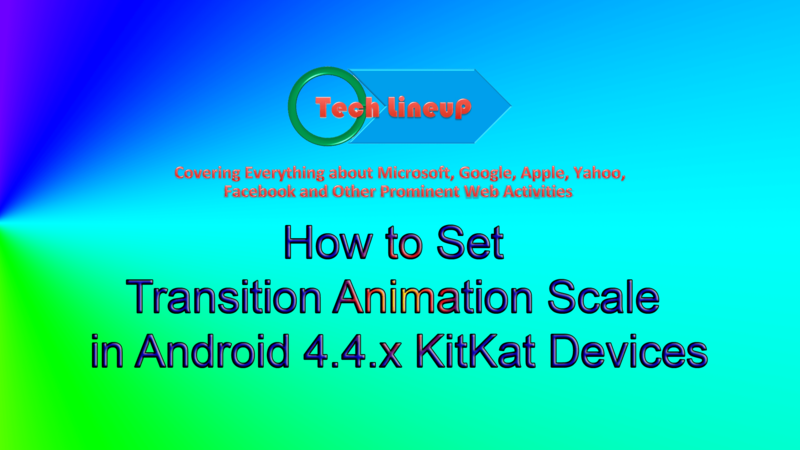 Depending upon the need, requirements or even mood, you may like slower or the quicker Transition Animation in your Android 4.4.x KitKat device. But, in normal usage, the quicker transition is liked. Slower animated transition looks good and even thrills to some but quicker transition is treated as the norm of the efficient working. Anyhow, keeping the changing moods of the users in view, Android has introduced a feature with which you may set the transition animation scale at your end, from none to maximum. Command Line: Settings – Home > Developers’ Options – System > Transition Animation Scale. 1: Follow the Command Line to open up the ‘Developers’ Options’. Scale. Scroll Down to the ‘Transition Animation Scale’ in DRAWING Section and see its scale is set on 1.0 by default. 2: Tap the ‘Transition Animation Scale’ to set it. It will open up a prompt with a slider. 3: The Slider has a scale of 0.0 to 10.0 while it is currently set at 1.0. You may move the slider with the touch and drag of the finger. Set the slider to the 0.00 to see its effect. 4: Go back to the ‘Settings’ screen, rotate Android device to right or left or even open up the prompt. See the transition animation is a little quicker. 5: Go to the transition animation scale prompt to set the slider to 10.0. Now, see the transition animation is very slow. It may be looking good but is not good for the normal working. 6: Set the slider scale in between 0.00 – 10.00. You will feel the improvement in the animation, a little quicker. After many such experimental settings, you may decide to set the transition animation scale to an optimum scale.Tutorial Video. Newer How to Restrict Purchase of Apps at Google Play by Password on Android 4.4.x KitKat Device?